WHAT IS THIS THING, "LINDY HOP"? The name "Lindy hop" seems to mean little or nothing to most people. The word "Jitterbug" is better known, but still few know to what it refers. Both terms refer to the same dance. Though there is some dispute over the matter, the official story is that the dance was named after Charles Augustus Lindbergh (1902-74), who in 1927 famously flew across the Atlantic in the Spirit of Saint Louis* and got played by Jimmy Stewart in the movie (surely an honour - Jimmy played Glen Miller too). In the 1930s Lindbergh became a public admirer of the Nazis, however, and so it seemed a bit inappropriate for his name to be linked to a jazz dance. Jazz was a multi-ethnic movement. Benny Goodman, King of Swing, had a Jewish background. "Jitterbug" became the more common name, although plenty of people still called it Lindy (and now you know why it is spelled with a capital L). Today the dance has been revived, and for no reason I know, is called "Lindy hop" almost universally. So much for terminology. 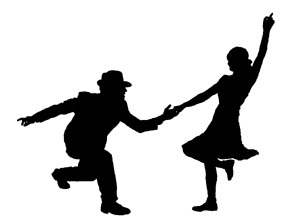 Lindy hop is a social dance. That is to say that it is danced in couples, with one person leading, and the other following. The lead and follow make it possible for the dance to be improvised. The two dancers can be in perfect synchronisation with each other, and do very complicated moves, and yet neither know what is coming next. This is perfect for a social occasion, as it makes it possible for total strangers to meet and be creative in each others' arms. It is possible that you are familiar with Ceroc and other versions of modern jive, so perhaps I could describe Lindy in terms of how it differs from those. Modern jive is taught with little or no emphasis on footwork. Lindy can have simple footwork, but the way it is taught, and the sort of people who dance it, place more emphasis on footwork. Because of this, it is in some ways a more complete dance, because there are so many more opportunities for variation and interpretation when one uses the feet more, and the body is making movements further removed from ordinary walking, and so looks and feels more dance-like. Modern jive (I believe that in Sweden a very similar dance exists and is called "Swedish Bugg". The French and Americans have their equivalents too) is led mainly through the arms. The two dancers have independent centres of gravity, and the follower knows which way the leader wants her to go, because he has signalled this by moving her hand one way or another. She follows her hands. In Lindy, she also has an arm lead, but she follows her centre of gravity. The leader has a much stronger connection with the follower. He needs this, because if he is to lead her footwork, she must feel which way she should go with her whole body. The position of her body determines over which foot she has her weight, which in turn determines which foot she can move. Accordingly, the lead and follow have to be much more precise, and accordingly, the connection between the dancers has to be a lot better. This makes the dance a lot more difficult, but it also makes it more fun, because each dancer can feel the other so much better, that it is a more tactile experience, and so much more satisfying when it goes right. Another difference with jive is that in Lindy, the man does more to share the burden of effort. He turns and spins almost as much as his partner, and covers as much distance over the floor. Perhaps you are familiar instead with salsa. One key difference with salsa is the freedom the woman (follower) has during the dance. In salsa, the man leads a move, and there is little the woman can do but follow in the standard way. I am not saying that all women salsa dance exactly alike, but the woman cannot stray much from the narrow path of following the moves her partner leads. She is either busy turning, having to be back in his arms as soon as she finishes, or else she is held in both arms, mirroring what he does. True, salsa dancers will sometimes break away and do independent moves, but they are not touching at this point, and are merely dancing near each other, rather than with lead and follow. In Lindy, the standard move is the Lindy turn, which lasts eight beats. The woman has to follow her man fairly closely on beats three and four, but the rest of the time she could be doing entirely independent footwork and styling. She is still linked to the man by one arm, and can feel what he is up to as well, and the couple remain in-synch. In short, the woman is far more of an equal creative partner in Lindy than in salsa. Another difference from salsa is that the music Lindy is danced to has breaks which are predictable. An experienced Lindy couple can hit all the breaks in the music, even if they have never heard the particular number before. A large part of the pleasure of Lindy come from interpreting the music, its highs and lows, the sudden hits and lulls, and the dance is well suited to this. By comparison, salsa dances are fairly constant and continuous. Again, I'm not saying that Lindy is better than other dances, I'm just trying to point out of the differences. I happen to prefer Lindy to other dances, because these differences happen to accord with my tastes. Perhaps you are familiar with ballroom styles. One difference Lindy has with these is that Lindy, like salsa and jive, is danced pretty much on the spot, whereas ballroom dances tend to circle the floor. Some dance halls used to have "No Jitterbugging" signs up to stop people dancing on the spot, so that the people trying to circle the room with the quickstep, wouldn't crash into jitterbugging swingers. Lindy is wilder than most ballroom styles. It has fast kicking moves, and plenty of turning and spinning moves. The distance between the dancers also varies a great deal, from very close, to as far apart as they can be while still holding on with one hand. Lindy is danced mainly to swing music. If you are like me, this is in your blood, and the easiest thing to feel and interpret. It tends to be happy and relaxed in mood, often humorous, though occasionally a bit bluesy. One big snag with the dance Lindy hop is that there is a hurdle which beginners have to clear before they can get good at it. This is the "Lindy turn" which is one of the core steps. A huge number of Lindy moves are variations on this one step. The snag is that it is quite tricky, and the follower has to know it in order to follow it. A tremendously good leader still couldn't get a novice partner to follow it. In the Lindy turn, the man holds the lady's right hand in his left. This frail bridge is his only connection with her, and it requires good technique to lead and follow viA this tenuous link. It ends in the same position. A variation on the Lindy turn is the Lindy circle which ends with the couple in what is known as the "jockey position" (why? I found out years after first writing this - see the Herräng 2002 account for an explanation) with both dancers side by side facing the same way. In this position the strength of connection can be very great, as the man can wrap his right arm across his partner's lower back. Here, the couple acts around a common shared centred of gravity. In this position, the standard step is the "long legged Charleston" - a lovely step moving forwards and backwards, which can be danced slowly and smoothly, or with exuberant hops and kicks. From here, the "swing out" gets the couple back out into the open position, ready perhaps for a Lindy turn. Most of the rest of Lindy consists of countless variations on these basic moves. Tune in, turn on, swing out. * Contrary to what some people will tell you, this was not the first non-stop flight across the Atlantic. The first was achieved by the Britons Sir John Alcock and his trusty navigator Arthur Brown, on the 14th-15th June 1919, in 16 hours and 27 minutes. Lindbergh took 33 hours and 29 minutes, and he was going the easy way (west to east). Another first for Britain.